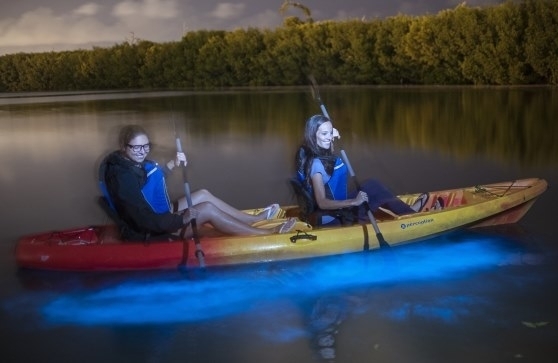 We need to preserve the Bioluminescent Bay (Bio Bay) here in Grand Cayman and protect the bioluminescent dinoflagellates from harmful skin lotions and bug sprays, boats using gas and diesel. With the existing homes around the bay, fossil fuel engines used inside the bay, swimming whilst wearing harmful skin lotions like sun screens and bug sprays containing DEET; the destruction of the mangroves that once surrounded the bay, we have already done enough damage to this environment. We are deeply concerned that swimming in the bay whilst wearing harmful skin lotions and bug sprays, the use of gas or diesel, as well as dredging the bay is going to harm this amazing natural phenomenon. Grand Cayman needs to classify our bay as a high quality or of exceptional ecological or recreational value, that cannot be altered except by natural causes. We need to implement the same laws that DNER in Puerto Rico has put in place in order to preserve our bay for generations to come. We should also enforce programs to teach our hospitality and tourism leaders, locals, and guests on how to protect our environment instead of harming it. Dredging, pollution, land development, and overuse of the bay’s water must be regulated, studied and preserved as one of Cayman's National Natural Wonders. Our first step to saving the bay is to NOT dredge it. Then we must try to enforce electric motors on the boats that travel inside the bay, no swimming with harmful skin lotions, hair conditioners and bug sprays, reduce ambient light to enhance the experience and replant red mangroves to replenish the bays nutrient sources. We can’t let these natural lights go out! We are asking the Cayman Tour Operators, Government of Cayman, Cayman Kai Property Owner Association, Dept. of Envirnment, Dept. of Tourism, Cayman's National Trust, DART, Cayman Residence and Tourist to really look closely at what we have left in our marine environment and protect these natural resources. Let's live by example and preserve this unique phenomenon before its too late. Say "YES" to preserving and implementing regulations for Cayman's Bio Bay at Rum Point. The Save Cayman's Bio Bay at Rum Point petition to Cayman Government, Dept. of Environment, Dept. of Tourism, Cayman National Trust, Cayman Kai Propert was written by Cayman Kayaks and is in the category Environment at GoPetition.